Fun Chaser presents a fiberglass deck boat suited for the casual boater looking for an affordable way to get out on the water with a roomy family fishing environment. Featuring two removable fold-down fishing chairs at the bow, rod holders and aerated live well, you’ll have everything needed to catch ‘em up in style. 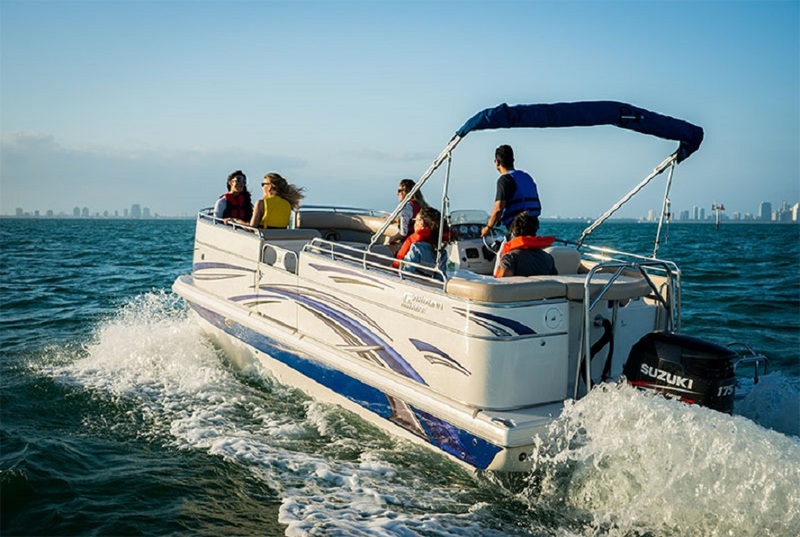 Gulf Marine is an authorized retailer and service center for Fun Chaser marine products. Give us a call with any questions or for any assistance. The 20 DS deck boat has a length over all of 20' ft 1" in and weighs 3200 lbs. It can handle up to 8 person with a maximum weight of 2052 lbs. It can handle up to a 200 hp motor and is NMMA Certified. There are dozens of standard features to add to your boating adventures, plus several upgrades and customizations to make it personal to you. The 2100 Cruiser pontoon boat has a length over all of 21' ft 4" in and weighs 3375 lbs. It can handle up to 14 people with a maximum weight of 2975 lbs. It can handle up to a 175 hp motor and is NMMA Certified. Most accessories are stainless steel and it even comes with a porta potty. Lots of standard features, upgrades and customizations offered.